A ring bearer has wedding-day jitters, but the man his mother is marrying has a daughter who isn’t the least bit nervous about being the flower girl. 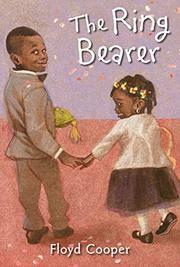 In this contemporary story wholly populated by African-American characters, Jackson is a little boy who feels a big sense of responsibility about being the ring bearer in Mama’s wedding. He’s worried that he may trip and fall and drop the rings, and so he’s grateful when Grandpop helps him and Sophie (his soon-to-be stepsister) practice walking “down the aisle slow and steady. ‘That way you won’t trip,’ Grandpop says like he knows just what’s in Jackson’s heart.” Sophie isn’t nervous at all, and when her exuberant skip down the aisle makes her almost trip, Jackson rushes forward to catch her before she falls. Somehow the rings don’t get lost in the shuffle, and Jackson’s gallantry is applauded by everyone at the wedding, leaving him feeling proud of himself and confident about his relationships with his new family members. Throughout, Cooper’s softly textured mixed-media illustrations offer a warm, affirming depiction of this black family’s life and love together, though Jackson looks like he’s about to sneeze when he first holds the rings and worries about them, which is a bit distracting.